FOUR Land Transportation Office (LTO) enforcers were arrested in an entrapment operation by agents of the National Bureau of Investigation (NBI) inside a hotel in Tagbilaran City, Bohol for allegedly extorting money. NBI Bohol Chief Renan Oliva said the LTO already gave them an intelligence report on alleged extortion activities by their enforcers in Bohol. The enforcers are Cebu-based and are targeting tourist vans for hire. “The LTO gave the report to us last October. So when a complainant, who has a franchise, sought our help because the said enforcers reportedly asked for P10,000 in exchange for the license they confiscated, we acted on it,” Oliva told SunStar Cebu. 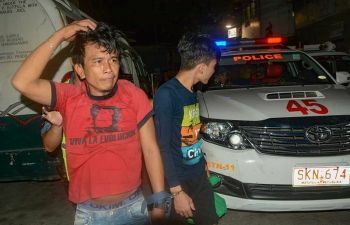 The four, identified as Gaylord Pacana, Bernard Jamorol, Walter Yncierto, Christian Hembra, were caught inside the hotel they were staying on Wednesday night, Nov. 28. The complainant, Oliva said, knew that his units were plying legally to and from tourist destinations of Panglao Island when they were allegedly illegally apprehended by the enforcers. NBI Bohol has yet to release the identities of the arrested enforcers. LTO 7 Director Victor Emmanuel Caindec said corrupt officials and employees have no business staying in government. He said the arrest of his four personnel was the result of his request to the NBI following reports of extortion by LTO enforcers. He did not know the person involved, so he requested then NBI-Bohol Oficer-in-Charge (OIC), Dominador Cimafranca to investigate. When the team of lawyer Renan Oliva, who replaced Cimafranca, conducted the operation, it turned out that the four personnel were organic LTO enforcers. Caindec said he sent to Tagbilaran City lawyer Vicente Gador Jr., the LTO 7 legal officer, to study legal steps against enforcers. “What we are advocating here is due process considering that the arrested persons are LTO personnel. But the people must know that we are not tolerating any form of corruption in the LTO because that is abuse of power and betrayal of public thrust,” Caindec said.